A central theme in our ongoing growth as a school is our relationship with our community, both locally and globally. The composition of this faculty reflects these ambitions bringing Music, Physical Education and Computer Science together, all of whom are at the forefront of our relationship with the world outside our tight-knit community. We work closely with the British Council to develop links with schools in other countries. These enrich our curriculum and that of our partner schools, broaden the future horizons of our students and provide life changing opportunities. Our current menu includes Music performances to public audiences at local music festivals and events on a very regular basis, Geography fieldwork in Iceland, Art curriculum projects with our partners in Egypt, Jordan and Palestine and we are currently planning an exchange visit with our partners in central China. Whilst this work is in its infancy it will be at the heart of our school’s future development as part of an international learning community. The subjects occupy around one fifth of the lower school curriculum. The Faculty offers a range of subjects for qualification at 16, which include GCSEs in Computer Science, Music and Physical Education alongside BTECs in Business, Dance and Creative iMedia. At Advanced Level the offer is focused around preparation for future working life within the business sector and creative industries, with Advanced Level Business and Music and Advanced BTECs in Creative iMedia and Music Technology. Our year 7 students arrive with vastly different experiences of PE and school sport. During this first year, students will transfer their existing basic skills from KS2 into the full context of sports, with the emphasis on enjoyment of taking part in physical activity in a safe yet challenging environment. Our programme of study includes a wide range of individual and team activities such as cross country running, badminton, trampolining, tag rugby, dance and athletics. Working with greater independence is key and students are encouraged to reflect on their abilities and begin to think how they can improve their performances under our guidance. Students have the opportunity to further develop their skills in a variety of clubs over the year and also to experience participating in some local school leagues, competitions and events for different activities. Students will refine the skills acquired and developed during activities in year 7 in order to apply them successfully in increasingly challenging situations. 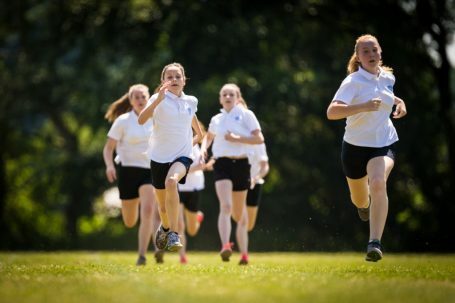 With continued emphasis on enjoyment of taking part in physical activity, our programme of study builds on skills developed in individual and team activities such as cross country running, badminton, trampolining, tag rugby, dance and athletics in order for students to carry out successful performances in competitive situations. Working successfully as a member of a group is key; students are encouraged to reflect on their abilities and use their growing knowledge to analyse the performances of others and offer advice on how these performances could be improved. Students have the opportunity to further develop their skills in a variety of clubs over the year and also to experience participating in local school leagues, competitions and events for different activities. During year 9, students will be challenged to apply their skills, knowledge and understanding of the activities they have experienced in order to demonstrate tactical and compositional awareness. They will be supported in developing their decision making, problem solving and originality in set plays and routines. Enjoyment of taking part in physical activity remains a key focus and students are encouraged to identify their preferred activities. Our programme of study builds on prior learning in individual and team activities through table tennis, trampolining, rugby, handball, dance and athletics amongst others and drives students towards performing confidently in fully competitive situations. Students’ analytical skills are developed during this year with greater confidence displayed when identifying strengths and weaknesses in performance and sound suggestions made as to how identified weaknesses could be improved. Leadership is a focus throughout PE in year 9 and students will be encouraged to take a leading role within group work. Students have the opportunity to further develop their performance skills in a variety of clubs over the year and also to represent school teams in district leagues, competitions and events. Students who have displayed excellent leadership skills in lessons will be selected to be a part of our Leadership Academy, taking an active role in organising and running sports festivals for our feeder primary schools. Those considering taking GCSE PE as an option are given a taster of all components of the course through the school’s year 9 options taster programme. All students continue to have 2 core PE lessons each week. Activities are planned according to the interests of each group. Some may take a competitive path, others a more recreational. The emphasis is on every student taking part and at times being challenged to work at the edge of their comfort zone by trying something new. Activities include zumba, table tennis, football, handball, netball, yoga and basketball. Some students also select to study GCSE PE. As in year 10, all students continue to have 2 PE lessons each week. Activities are planned according to the interests of each group. Some may take a competitive path, others a more recreational. The emphasis is on every student taking part and at times being challenged to work at the edge of their comfort zone by trying something new. Activities include zumba, table tennis, football, handball, netball, yoga and basketball. Our GCSE PE students embark on the 2nd year of their course. Why some people can run faster than others? How your personality affects your performance? How you could become an elite sports performer? Why people take performance enhancing drugs? How technology can help you? Study A Level Physical Education to find out the answers.